It was in 1999 when I first visited Balaw-Balaw as part of an educational trip organized by our Humanities professor in college. I am happy to revisit Balaw-Balaw for the second time after 12 years. The restaurant has been serving exotic dishes, which include lizards, insects and frogs (to name a few), long before the terms "food adventure" and "food trips" started appearing online. 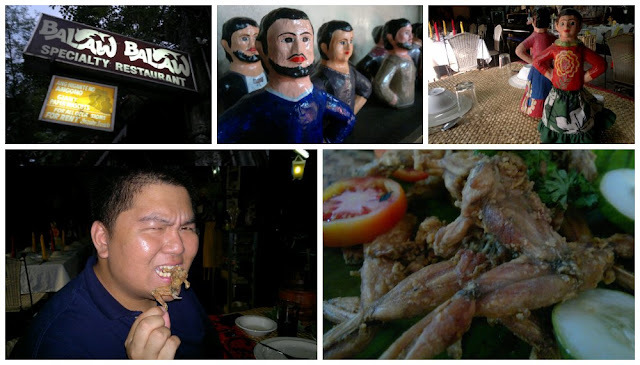 We ordered adobong baboy sa gata and nilasing na palaka (fried ricefield frogs). As the saying goes, lasang manok lang (they tasted like chicken). The restaurant also houses an art gallery showcasing paintings and sculptures by local Angono artists. Dominating the restaurant are miniature human figures made of papermache. The giant version, called higantes, are used during the street parade in Angono held every November 23 in celebration of the feast of San Clemente, patron saint of Angono. From Angono Petroglyphs Museum, it only took us a 15-minute downhill drive to reach Balaw-Balaw. This concludes our day-trip to Angono, Rizal.